According to Gartner, by 2017, 89% of marketers expect customer experience to be their primary differentiator. In order to create terrific customer experiences that set our apps and websites apart, we need to learn a bit more about how our brains work, and how we can create experiences that are memorable. Fact: human brains are lazy. We love a shortcut. Let’s take a look at how that impacts on the way we design user experiences, and how we can design for lazy brains. People judge an experience largely based on how they felt at its peak (i.e., its most intense point) and at its end, rather than based on the total sum or average of every moment of the experience. The effect occurs regardless of whether the experience is pleasant or unpleasant. Let’s think about that for a second. It’s a big deal. When we remember experiences, we tend to recall only snapshots of the key events that happened. This means that we might easily recall a singular negative event (like a rude customer service representative) and forget the better but smaller aspects of the experience (like a well-designed website). Or, vice versa, we might dislike an experience overall (bad website UX), but what we’ll remember later is the terrific customer service received. An everyday example of this is movies. Have you ever watched a brilliant movie, only for it to be spoiled by a disappointing ending? Two hours of spellbinding suspense can be rendered useless with a bad ending, much like an exciting online shopping experience can be ruined by a confusing/frustrating checkout. Even if the middle of the experience was faultless, that’s not the aspect of the experience that users will remember. So we know that our brains like shortcuts. We know they remember the end and the most intense moments of an experience more than any other moment. In addition to that, we should also remember that our memories are faulty; they aren’t always correct. People won’t always remember what you said to them, but they’ll remember how you made them feel. So, with that in mind, we can then make changes to the experience to ensure that users forget negative moments, and remember positive ones. Some menial tasks, such as filling out a form, users won’t want to remember. By simplifying the experience and removing friction, users can breeze through this step. We don’t want the peak moment to be a horrendous one. Not only does this often overshadow the somewhat long/boring search for an Airbnb, but it improves the user experience towards the end as well. Now, when the user remembers Airbnb, they’ll remember how exciting it all was. Even though Airbnb bothers us with sending itineraries and recommendations, this is the sort of friction we’re happy to engage in. In short: stretch out positive moments, and relieve the user of negative pain points quickly by removing friction. Remember taxis? Remember arriving at your destination and then fiddling around for cash? Yeah, this can be awkward. You realize you don’t have the right change, so you pay with credit card; the card machine isn’t working, so you have to drive to the ATM. It’s a rather awful, frustrating, embarrassing experience. Your Uber account is linked to your bank card. Once you’ve arrived at your destination, you hop out of the car and you’re done. Fiddling around for cash is not necessary; that pain point has been removed, and so the user walks away with their final experience with Uber being one of delight. Flat moments are moments that are neither fun nor boring. An excellent example of a “flat moment turned memorable” might be from way back in the early 2000s, from an e-commerce website called CD Baby. Typically, when you make a purchase online, you receive an email confirmation to notify you that your purchase went through smoothly. This is fairly standard, and important. People loved it. It went viral. Derek had turned a boring aspect of the experience into an unexpected delight. 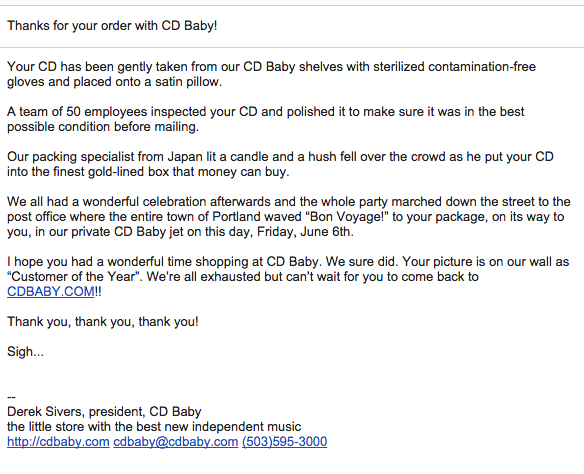 People were suddenly purchasing from CD Baby just to see the email (remember, this was the early 2000s!). If we map out the customer journey, we’ll find that the email had become a peak moment, and a surefire way to create a memorable experience as the user — hopefully temporarily — departs from CD Baby. The project management tool Asana springs to mind when I think of unexpected delight. 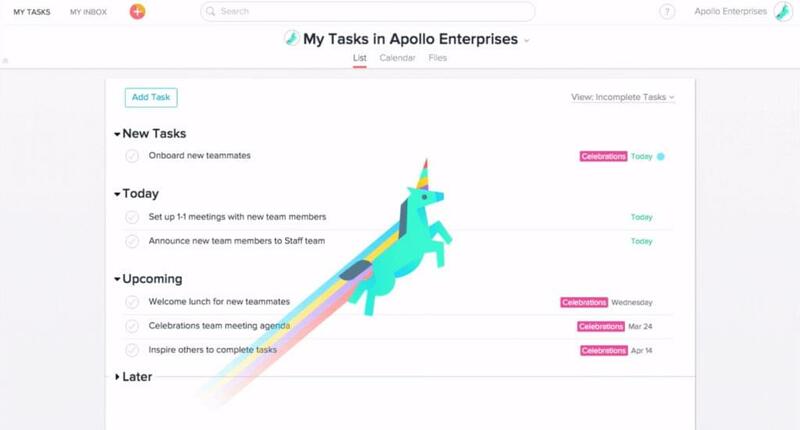 When you complete a task, sometimes, just sometimes, you’ll see a unicorn fly across the screen. It was first introduced as an April Fools Day Prank by Asana, but users loved it so much that it received an update and even some new friends when they redesigned in 2016! A quick thought experiment: what would you prefer, a 45-minute train commute or a 55-minute train commute? If you decided upon the 45-minute commute, consider this: the 45-minute commute is without Wi-Fi, but the 55-minute commute has exceptional Wi-Fi. Which is better now? If I were on the train for business, I’d be frustrated at losing an hour of my day where I could be doing work. With Wi-Fi, the time matters not. If I were on holiday and the train travels down a beautiful coastline, then a longer journey is actually better, whether there’s Wi-Fi or not. Context matters. Can a negative experience be improved? If not, can it be shortened or flattened? Which would have the best result overall? We’re not rational beings. We’re lazy, we’re forgetful, we’re impatient. Our brains like shortcuts. All of these facts come into play when we’re designing UX, and we should be thinking about these flaws in human psychology every step of the way. Activities like journey mapping help us not only to build empathy for users, but really examine the journey that users take as they navigate our digital interfaces and the emotional roller coaster that can be. So how can we succeed? We can be consciously aware of the “big moments” in the experiences we create, reducing friction at tricky moments, boosting friction at delightful moments, and ending the overall experiences on a highly positive note. Vinny is an experience designer based in Melbourne, Australia. He's passionate about using design thinking and experience design in business big and small, whatever the budget. You can read about his work on his personal website or follow him on Twitter (@doublethought).